Jazira of Melos was kidnapped, imprisoned, and seduced for her power. The most powerful sorceress born into the royal family in hundreds of years, she is a bargaining chip to her uncle, the king, a threat to their enemies on Anthea, and hopelessly in love with a traitor. The only way to escape the forces warring to control her is to buy a ship and flee the galaxy. She’s on her way to claim that ship when her enemies finally catch up to her. Their weapon of choice? Poison. When she wakes, she is not in a prison cell, as she expected. Instead, she has crash landed on a primitive outpost, her new ship is in serious need of repairs, and she was rescued by the one man she swore never to trust again. Trystan is a man without country or planet to call home. His entire life was dedicated to the defeat of his evil father. When the beautiful and powerful Jazira appeared in one of his father’s prison cells, he did the only thing he could to ensure her survival, he seduced the innocent young princess and claimed her for his own. Trystan used her magic to destroy his father, but it cost him Jazira’s love and trust. So she ran, determined to leave him behind. Forever. Now Trystan has one loyalty. One home. One mission…to keep Jazira safe. When they crash on a hostile planet with enemies hot on their trail, the fools hunting her underestimate just how far he’s willing to go, not just to ensure her survival, but to reclaim her heart. Trystan pulled her flush against his chest and wrapped his arms around her, his back turned to the door, his blaster pointed the way they’d come in case the two miners managed to escape their temporary prison. Zira didn’t fight him, but she was confused. “Trust me. Cleo is full of surprises.” Trystan actually chuckled, the sound deep and comforting beneath her ear. His complete calm soothed her frayed nerves and she felt like she could breathe again. “She’s a companion bot. Gen4. My cousin helped design them back on Pelagos. That thing will crush her.” Her cousin on her mother’s side was fifteen years older, not in the royal family, but an incredible engineer. The family was very wealthy, in no small part due to the family’s mathematical and design genius, of which she’d inherited none. No matter how hard she tried, she couldn’t get past level three computronics courses. “I guess I am.” And wasn’t that its own little piece of insanity. Cleo was standing in the open doorway, a very aroused Leo a few steps behind her. The male companion bot looked like his circuits were overloading as an unending swirl of lighted electrical currents moved in massive waves across his exposed skin. Trystan stepped through what was left of the door and she followed. All that was remained of the red badge guard was a set of detached hips and legs, and more tiny pieces than she could count laying like broken toys in the dark purple dirt. The robot was completely destroyed. 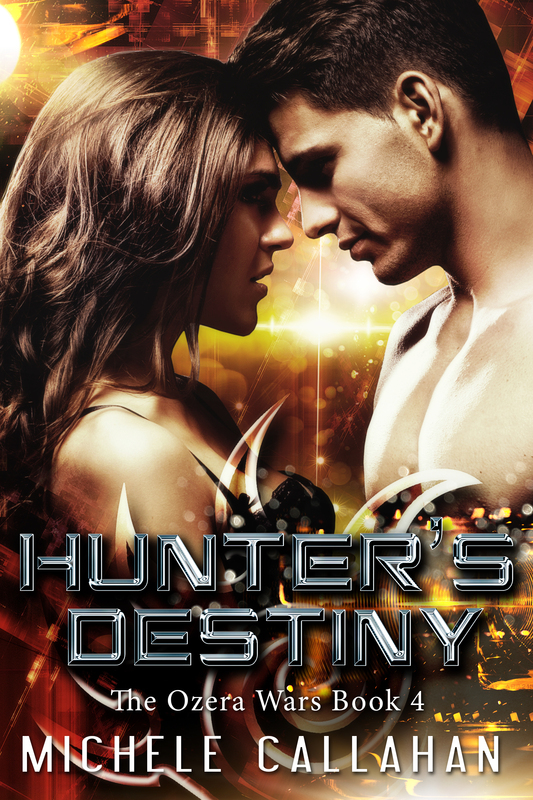 HUNTER’S DESTINY – Available for Pre-Order. April 9 release date. Don’t miss the chance to read these great stories! Thanks, Michele, for sharing your books with us!